The following is courtesy of the Bodmin & Wenford Railway Website. The T9s were nicknamed Greyhounds on account of the turn of speed they could achieve. When first built, they were used for the lightly loaded expresses from Plymouth to Waterloo at a time when there was fierce competition between the LSWR and the GWR for passengers arriving on the transatlantic liners. In later years No. 119 was reserved exclusively for use on the Royal train, but it was No.120 which later achieved celebrity status when restored by British Railways to its LSWR livery it was used on enthusiast´s trains in the early 1960s. 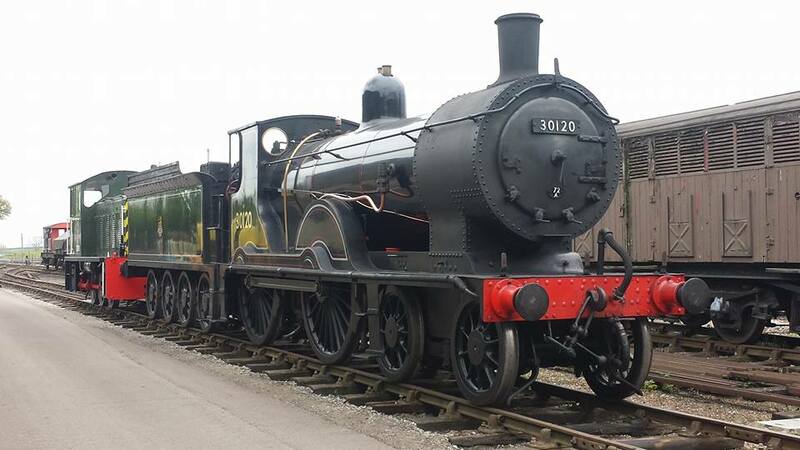 No.120 became part of the National Collection, and was on display at York for a time. It was subsequently returned to working order, and has run on the Mid Hants and Swanage Railways and exhibited at the Bluebell Railway before moving to Bodmin in February 2008. The locomotive was restored to fully working order by the Bodmin & Wenford Railway Trust at the Flour Mill Workshop in the Forest of Dean, and the locomotive had its public debut in September 2010. The loco is now usually operational at steam galas and can be seen hauling service trains from time to time. The T9 came to Quainton for approximately 2 weeks for the 2017 Steam Gala in May 2017. Tractive Effort :- 17,670 lbf Boiler Pressure :- 175 psi Cylinder Dimensions :- 19" x 26"